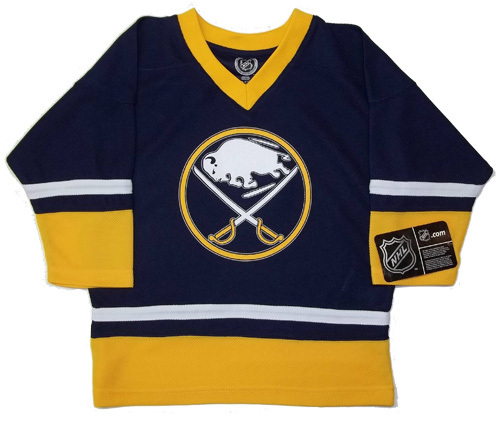 Brand New – first quality Officially Licensed NHL Buffalo Sabres Hockey Jersey. Jersey feels and looks like what the pros wear, machine stitched throughout. Buffalo Sabres logo on chest is a very heavy screen print. There is no player name or number on this jersey. Fabric colors are nice and deep. Jersey can be machine washed and put into a dryer, holds up well. Jersey will fit most small skaters. WIDTH - From side seem to side seem (you can also measure arm pit to arm pit) it measures between (16” to 17.5”) wide. LENGTH – From top of back collar to bottom hem it measures between (19.5” to 22.5”) long. Click the appropriate button to purchase.